This morning we had the opportunity to attend the baptism of a little boy in our ward. Andrew played the piano. I brought cookies. It was lovely. Did I say "this morning"? I meant this afternoon! Last night was awful on the Benjamin-front so we kind of wasted our morning away and didn't really get moving until mid-morning and then it was time for the baptism. A quick stop at the grocery store on the way home put us at mid-afternoon by the time we got home. Andrew had a bunch of projects to work on so I took the kids on a hike by myself in order to give him some peace and quiet. It was a lovely adventure and I took a billion (or 140) pictures, so prepare yourself. Here's Rachel crossing one of the bridges on the trail. She remarked several times how silly these bridges were because they "didn't even do anything!" I thought they were much better than squelching through the mud but that was obviously just my opinion. Two of the three kids I had with me think squelching through mud is awesome (Miriam does not agree). It's a little swampy in the forest right now. The girls were worried we'd stumble into an alligator but I did my best to assure them that alligators don't live this far inland. 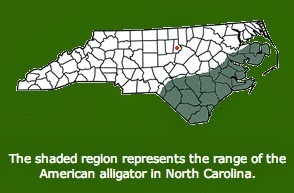 This is a little map showing—as it states—"the range of the American alligator in North Carolina" (I found the map here). I added the little red dot to show you where Durham county is (in case you didn't know). I suppose it's not impossible for an alligator to stray this far inland but it does seem unlikely. At least, I think they're deer prints. They're cloven hoof prints, whatever they are. Perhaps it was a wild boar. But I'm guessing it was a deer. Side note: Is it just me or are there a lot of 500-pound crazy critters lurking around these parts? A 500-pound alligator in July and a 500-pound boar in March? What 500-pound creature are they going to drag out of the woods next? What dangers lie between these swampy trees? We didn't find anything too dangerous. We did, however, find a lot of frog eggs. Before you read further, take a guess on whose hand is holding out these frog eggs? Which child of mine would bravely grab a stick and swirl it around a putrid puddle to pull out slimy sacks of frogspawn to examine? Even Andrew guessed wrong when I showed him the picture! He thought for sure it was Rachel. But it wasn't. It was Miriam! She thought it was a little gross (but fascinating at the same time). We put them back and continued our little stroll. Rachel and Miriam went up ahead for a while and chatted together about who knows what. I love it when they do that. At the end of our hike we came to a playground where we let off some excess energy. I actually sat down to watch them play because I was plenty worn out from carrying Benjamin in the backpack. Benjamin, on the other hand, was anxious to get down and run around. His sisters gladly joined him. We call this park "The Purple Slide Park," for obvious reasons. I'm sure it has a proper name but I'm not sure we'll ever use it. The kids did plenty of sliding and plenty of swinging. Benjamin thought he was pretty hot stuff, sitting on the big-boy swing. Miriam desperately wanted to push him but I told her that was my job. When they were tired of swinging the kids tried some puddle jumping (jumping over puddles, that is). Benjamin mostly ended up puddle splashing, but he was fine with that, too. Miriam was very frustrated by the game. She was worried she'd miss and would end up muddy so she stood there and pouted for the longest time until I pointed out she could walk to where the puddle ended and go around. Benjamin was clearly not concerned about the chance he'd end up muddy. I think he looked at is more like an opportunity than a hazard, really. And he learned a new word today: MUD! ...and now she won't put a foot in it. Literally. Miriam cries at the prospect of having to step in the mud. She did, however, eventually get brave enough to leap across the mud puddle (even if she chose the narrowest, least muddy spot possible). I thought the kids were cute playing on the different levels of these bleachers. Naturally, I couldn't ever get them to all turn and smile at the same time. I'm not sure if I've mentioned this before, but Benjamin has this little swagger-walk that he does. He puffs out his chest, swings his arms like a boss, and just...struts. It's hilarious. He tackled the play set like a pro. I was impressed. He didn't hesitate at all. For anything. I quickly came over to him just to be close in case he needed a hand. Not that I'm a helicopter parent...just that he's one. He made it all the way up to the top with minimal help (he slipped through the bars once and I helped him find his footing again). It was hard work but he was quite determined to do it. It took him several minutes to get to the top and once he did he slid down the nearest slide. All that hard work for a three-second thrill! And I didn't even have that heart attack I thought I'd have! No one really wanted to leave the park (even though we had to if we were going to get home in time for dinner) so I told them all to do x-number of things and then we were leaving—no ifs, ands, or buts. Once I put my foot down they happily agreed to leave the park. After all, we had the whole walk home to play. These kids often complain about having to walk too far but today was too beautiful for them to complain, I think. Andrew asked me how many tantrums were thrown (Miriam still thinks she should be carried when she gets tired) and was quite surprised when I told him none (I was surprised, myself). Here are the girls by the Eno River. They wanted me to take pictures of them. Then Rachel wanted to take pictures of Miriam. Then Rachel wanted me to take pictures of her (Miriam almost got bent out of shape that she didn't get to take any pictures but quickly pulled herself back together). Here's Miriam standing in a bit of the woods she thought was interesting (the creek has a little island in it back there). And here she is getting ready to cross a stream using an old log. And here she is completely chickening out and whining about how she "just can't do it!" When I said no one threw any tantrums I meant no one threw themselves on the ground screaming about how unfair the universe was, not that my kids had happy attitudes 100% of the time. I ended up helping her cross the log. We had to stop to smell some daffodils we found along the path. We'd just passed some horse footprints in the grass along the road and Rachel was unsure if she believed they were really horse prints. "It could be a deer," she posited. "It couldn't be a deer," I said, "Because a horse has a hoof that's shaped like a U, just like the prints we're seeing. Those are horse shoes making those prints. Deer have cloven feet. Cloven means that it's broken into two parts, so a deer has two toes on each foot. Remember the deer prints we found in the woods? They had two pointy indents right next to each other." We noticed the spine of the deer first and only found the leg when the girls went to examine the spine. Only when I was able to point the two toes out to Rachel did she believe me that the horse prints were from a horse (because obviously a deer with a foot like that couldn't make prints like those). Rachel was really grossed out by the sinew and fur left on the bones, but on the whole the vultures and other creatures did a good job picking that deer clean (we get a ton of vultures scavenging for road kill around here). The girls were tired by this time and slowly trudged along beside me (Rachel carrying a container of frog eggs) until they spotted their friends playing in the backyard—then they found their second wind. "Can we go play? Can we go play? Can we go play?" I gave them permission to play until it was time to eat and carried the frogs eggs home myself. Andrew made macaroni and cheese for dinner while I warmed up some leftovers for myself. It's stake conference this weekend and the adult session was tonight. My friend Marian wanted to go but didn't want to drive alone. She was leaving her husband home with their three kids and suggested I do the same to mine, so I did! It was fun to chat with her in the car and to have someone to sit with during the meeting. Benjamin was begging for bites of my dinner until he noticed the container holding the frog eggs sitting on the table in front of us. "Oh, Benjamin," I said. "Let me finish eating my dinner first. Can't you acknowledge how cool of a mother I am that I'm allowing a container of frog eggs to sit on the dinner table in the first place without asking me to show them to you while I'm eating?" Anyway, it was a great day. I had a great time out with Marian. Andrew had an easy bedtime with the kids (I think they were all quite worn out, though Rachel stayed up reading Harry Potter until I got home (and beyond)). And the frogs will definitely be finding a new home outside long before they develop legs. What a fun hike! I enjoyed taking it with you via this post! 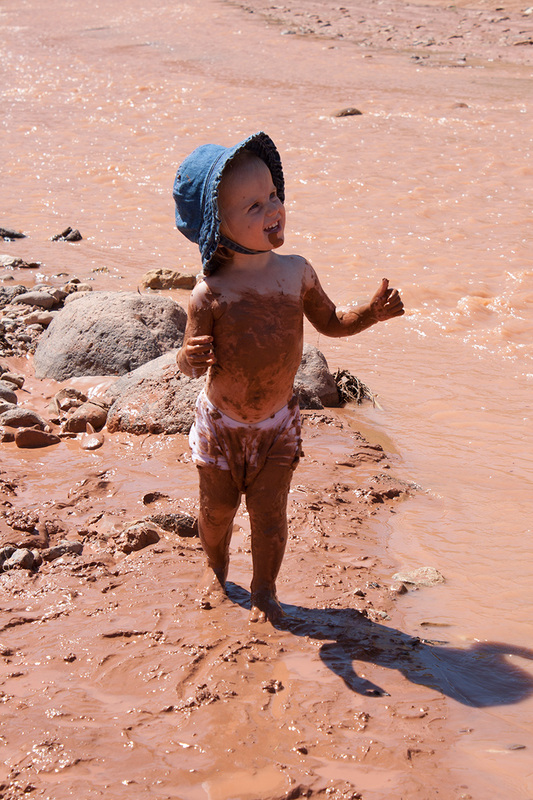 :) I love all those swampy, muddy pictures, and that you let your kids get dirty. Looks like a wonderful adventure. Yesterday was a lovely day. I wish I had gone on a hike. I dragged tree limbs at my parents' house instead.